Sign up March 1 – May 31 and receive a special gift! As a special thank you, we have great gifts at all levels of giving! THANK YOU for supporting patients and employees in crisis with your generous gift to CoxHealth Foundation and Children’s Miracle Network Hospitals. EXISTING CoxHealth Employee Donors increase your payroll gift by at least $2 and receive the gift at your new level. If your $2 increase per pay period makes your gift $12.00 or more, you qualify for the CoxHealth light-weight jacket and phone charger. Thank you for being an Employee Donor. Your gift has changed lives and improved community health. You are an important part of our donor family and we appreciate how you have empowered people back to good health by being a donor. To upgrade your gift please select the amount you would like to add to your current gift in the box below. Increase your payroll gift by at least $2 and receive the gift at your new level. 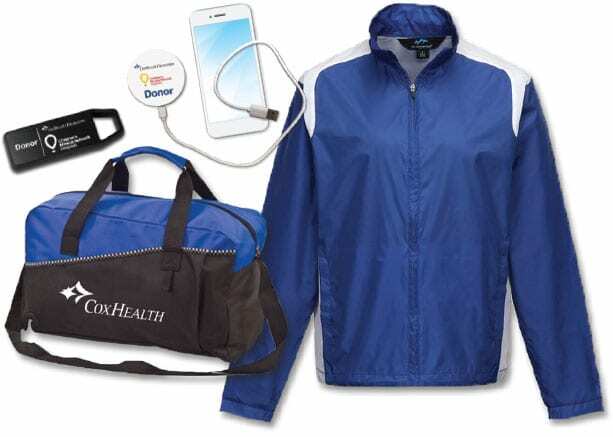 If your $2 increase per pay period makes your gift $12.00 or more, you qualify for the CoxHealth light-weight jacket and phone charger. To qualify for the $2 minimum upgrade, you must already be an employee donor for 120 days. $12 minimum gift to receive a free jacket. I authorize a payroll deduction from my CoxHealth paycheck as a charitable contribution. I understand that the amount I selected above will be deducted from my paycheck each pay period with automatic renewal. Cancellation will require 120 days minimum participation. All of this is possible thanks to the incredible generosity of CoxHealth employees. As the most giving, caring employees- CoxHealth has surpassed many hospitals its size and bigger in employee support. Today, right at 2,600 employees, administrators and physicians give to the Good Samaritan Employee Giving Program. Your help in joining today allows the CoxHealth Foundation to continue to answer YES to your calls for help when a patient expresses a need that they have no means to meet. It also allows us to provide ongoing support to employees through our Cox Family Assistance Employee Crisis Fund. Thank you for the help and the hope. Terms and conditions: To be entered in the drawing for prizes you must be signed up for employee giving through payroll deduction. A gift must be split evenly between the Children’s Miracle Network Hospitals and CoxHealth Foundation. You are eligible for the prize drawing each month that you are an enrolled donor with payroll deduction occurring. If a donor drops out of the employee giving program at any time during the course of the prize drawing you are removed from eligibility for the month you withdraw and any other drawings for the remaining of the year. You are eligible for the year end drawing only for the months in which the giving occurred. Each employee donor has the opportunity to win one of four gift cards for a movie and a popcorn at Alamo Drafthouse Cinema. Winners will be drawn on the last business day of the month. The grand prize drawing will be held in December of 2019. All prizes will be awarded the last day of each month and the winner will be notified electronically and via the CoxHealth Connect Daily e-blast. If the employee is terminated from CoxHealth they are no longer eligible for the drawing. All employee donors must be in good standing at the time of the drawing. All current employee donors will be included in both the monthly drawings and year-end drawings as long as they remain active in their giving. To receive the maximum number of entries, donor must give monthly to both CHF and CMNH. Donors giving to one agency will receive half the number of entries possible.